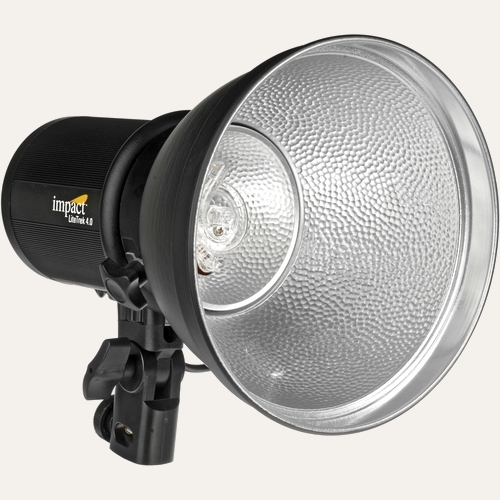 New York: B&H, the American photographic superstore, have released a battery-powered monolight under their Impact brand. The Lite Trek 4.0 (shown right) has an energy rating of 400J, a 50W modelling lamp and a Comet bayonet. Powered by a lightweight lithium ion battery and tipping the scales at 900 grams (2 lbs), the Lite Trek is designed for location photography use. Savvier readers may recognise the profile of the Impact Lite Trek 4.0. Haven’t we seen something similar from another company? This CononMark-made monolight is now available under a number of brands, so let’s compare them. It’s worth noting immediately that not all of these lights were born equal. As well as variations in price and after-sales support, there are a range of bits and bobs swapped in and out of the kits and some physical differences too. As shown in the table above, some heads have ⅓-stop more or less flash intensity. Certain kits will include 35-Watt modelling lamps while others offer 50 Watts. The Photoflex TritonFlash has an improved mounting bracket and a flash tube that dissipates heat more quickly (see this review). Unfortunately, one thing that none of the resellers changed is the Comet bayonet fit (the same as on the CononMk DD400S). A hard-to-find mount at the best of times (in the UK at least), you will either have to sacrifice angular coverage with a Comet-Bowens adapter or seek out a Comet speedring insert for your softboxes. The light itself makes use of insulated-gate bipolar transistors (IGBT) in the same way as a speedlight, achieving very fast flash durations as power reduces from full to 1/64. There is a stroboscopic “FP” mode allowing for creative multiple-flash applications and the manufacturer claims the DL 4.0 can keep pace with DSLRs firing at seven frames per second. Photographers mixing lights can use the battery pack as an high voltage power supply with their hotshoe flashes. Have you got one of these lights? How was your experience? Are there any sellers we’ve missed? Let us know in the comments below.